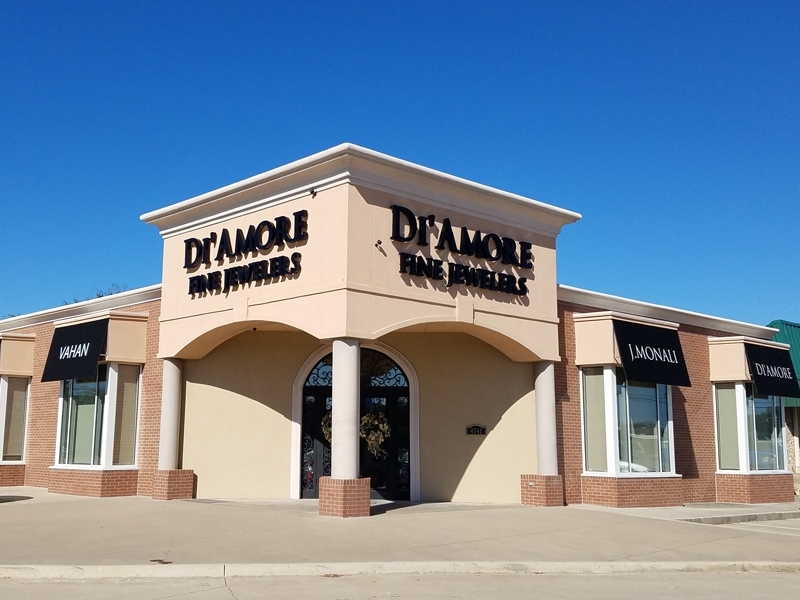 Walking into Di’Amore Fine Jewelers in Waco, one is taken aback by the sense of calm, the glittering jewels and lights, and all-around warm welcome. This man? This is a story you don’t want to miss. The jeweler goes on to say he and his brother were business partners, originally. Now, their two boys are also working together, still with the hotels. Cute, huh? That man owned a shopping center in Gainesville, where Jay lived. He extended the man an offer: you take one of the shops in the center to open a jewelry store. I don’t pay you a management fee; you don’t pay me rent. Jay responded, “That's fine, but, I don't know anything about the business. What do I have to do?" So Jay found a $500 safe. The Zales Corporation was getting rid of their showcases for $1200, and he had an alarm system installed. Within a month or so, he was in business. That was working just fine until a customer needed a ring sized; the new jeweler didn't have anywhere to size it. The solution: Jay’s mentor, an hour away in Dallas, offered one of his work-from-home jewelers to do the repairs. Both guys’ shops closed at five. Jay would drive the repairs down, wait for the crafter to finish, and drive back to Gainesville. He felt responsible to serve his customers. Young Jay learned that Paris Junior College had a whole division of jewelry technology and of watch technology. The curriculum was four semesters of jewelry, four semesters of watch-making, and one semester of gemology. In January of 1988, Jay enrolled; he graduated in 1989 after going through the jewelry and gemology instruction. “Up to that, I hadn't seen any jewelry tools, everything was brand new to me: the bench, little bitty files, little bitty torch. For half of a semester, I couldn't even solder two pieces together. My professor told me at the end they thought I wasn’t going to make it. But something clicked and from that point on, I ended up being the best student in the history of the school. They gave me an award, the Swest Award for Excellence. Swest gave a thousand dollars for tools to the best student. In 1995, they inducted me into Hall of Honor. No jewelry student had been and no student since has been inducted. The workmanship was there but because of the ethical standard I held – to be inducted into the Hall of Honor, they looked at so many other things like what you did with your life after the education. They came and saw me at my store, saw me with the customers and things like that. Jay now sits on the advisory board for the program. Gainesville became too small a town for Jay to cater to, so he opened a kiosk in Sherman. In the mall. For seven months, all they did were repairs. He and his wife left home at nine in the morning, came in at ten at night. Jay described, “We knew there had to be a better way to grow. We were looking for a place that would let us sell as well as repair. Dallas, Houston, all the big cities I went to said we could do repairs, but they had enough jewelry stores. A friend encouraged me to look at Waco. I didn't know what "Waco" was! They allowed me to sell at Richland Fashion Mall in 1991 as Jewelry Repair and Design. And in 1993, we opened up Jay Jewelers, just one location before we moved to our own building. I'm not a young chicken anymore and was so tired of mall hours. In 2012, my banker called me. This location used to be a Talbots. He said, 'The price is right, location is good, go sign on the dotted line, I'll take care of everything else.' So we took care of that. It took me a while to redo the store the way I wanted it but in September of 2014, we moved here." Jay's team seems more like family, "We have an awesome staff. I had a girl named Pam. Pam Powell. She was black, husband was white. They got married in '70s so they had to go through so much. The interracial marriage - they were not accepted. And that woman, was – angel." But she was true to her word. She died out of cancer." He whispered, "2006." Adamant remembrances flowed out of Jay, "She was awesome. She taught me how to live, how to die. No regrets. She was so sick. So Abby, my manager, and I would go to her house, spend time with her. Even when she couldn't even move around, she was laughing. No regrets whatsoever. Died peacefully. Even after all of those trials and tribulations of cancer and treatment." He went on to speak of how he hired Abby. She was 19. He noticed her exceptional personality as they both were at a wedding. He looked at Abby and said, "The business isn't ready for you yet, but when it is; I'll call you." The time came soon after and Abby's 35 years old now and still working with Jay! His "adopted son," Rehan, runs the store in the mall, Jewelry Repair and Design, opened in 1991. Jay's daughter, Monali, is the president of the company and son, Alok, lives in Dallas running several other businesses. The way he speaks of each of his employees shows care: Ben, Rachel, Barbara, all of them. His business philosophy? "Every time I get somebody on board I tell them, 'We are not here to sell anything. I do not want you to think about selling. Selling is where the business happens, but that's not your focus. Your focus is taking care of the person walking into this store. They got off the couch, drove to our door, for a reason. Find out the reason, and solve. That is our job. We are their servants. You are not a salesperson; I am not a business owner. We are all servants, to everyone who comes to the door.' That way you never have ego, 'I'm somebody.' - I'm nobody. I'm here to cater to you. That culture, that's evolved. That's what the whole culture is about. You never think about making a sale. Read our reviews, they say, 'They never put any pressure on you.' It's peaceful. When you walk into the store, it calms you." This is a part of meditation that I really like, you watch things happening. Who did it, why it happened, none of it matters. Just how you react to it. Let's see how we can solve this problem. We are social animals, sure, let's try to make sure it doesn't happen again, but if it does, still the same thing - don't worry about it." When I asked about sales and jewelry, what's fun to sell, he quickly replied, "The team enjoys catering to the young couples because they're in loooove and looking for the perfect riiiing. This is a happy occasion store; people buy for anniversaries, birthdays, etc. I told them, 'I'm going to test you guys out once in a while; if I find out you're not in love, I'll buy back your ring!'" We asked Jay to name the wildest thing he'd ever been asked to do in the business. The stone she chose was much higher than everything else, so there was a space beneath where I could put a tiny tube. We capped it on one side and then had her come in and, by her own hand, put the ashes in there, and we capped it on the other side. She didn't know what we were going to do. We found that, in the end, you see the little gold underneath; it didn't look that good. So, I put a diamond on both sides. That was my gift to her. When she came to pick it up, she was extremely thrilled and I said that's all I want! That was pretty challenging because how do you incorporate ashes..."
Behind the sparkle of Di'Amore Fine Jewelers beats a unified heart. This stellar team does watch repair, jewelry repair, appraisals, along with outfitting your bling to the nth degree. Don't forget to download Towny before you swing by. You'll catch instant perks, useful the MOMENT you get the app and your download helps to build up your city, one local purchase at a time. Get the app here to start now!